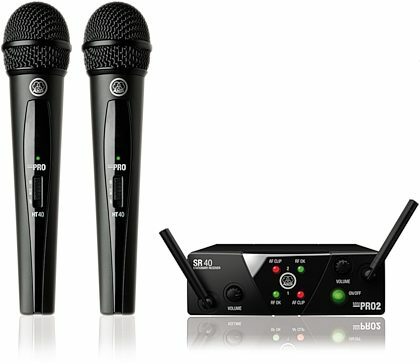 AKG Delivers Two Handheld Wireless Mics for a Great Price! The AKG WMS40 MINI2 Dual Vocal Handheld Microphone Wireless System is an excellent wireless mic package that puts two great microphones into your hands. It is an ideal system for houses of worship, presenters, and musicians. The receiver is designed with two channels, so that both microphones can be used at the same time. It is perfect for situations in which two vocalists are speaking or singing simultaneously, or in situations where you need to send wireless microphones down either side of an audience in Q&A sessions. The two microphones in the AKG WMS40 MINI2 package are HT 40 Mini handheld transmitters. They each feature a noiseless ON/OFF/MUTE switch that's simple to operate with your thumb. A durable wire-mesh cap protects the cardioid mic element inside. The microphone case is durably built as well, intended to withstand the rigors of touring and performing. The battery life on each HT 40 handheld microphone is quite remarkable -- running around 30 hours off a single AA battery. They work best with rechargeable batteries, saving the planet, and saving you money. Using the AKG WMS40 MINI2 Dual Vocal system is super straightforward. Turn on the handheld microphones and receiver -- and you're good to go! If there are any clipping peaks or RF interference, the LEDs on the receiver will let you know. The SR 40 Mini2 receiver comes with numerous features that make onstage operation simple. There are three Status LEDs each for Channels 1 and 2, which indicate ON/OFF Status, Received Signal Strength, and Audio Clipping. Each channel has its own Volume control. The two microphones' summed signals are sent to a single 1/4-inch output jack, ready to plug into your console or powered speaker system. The receiver is powered with the included universal 12-volt switched mode power supply. zZounds is an authorized dealer of AKG products. The WMS 40 Mini2 Vocal Set Dual ensures brilliant sound and ease of use at an unbeatable price/performance ratio. Unique HDAP (High Definition Audio Performance) technology ensures the best possible, most realistic sound at any time. The SR 40 Mini2 receiver provides three status LEDs each for channels 1 and 2, indicating ON/OFF status, received signal strength (RF OK), and audio clipping (AF CLIP). The VOLUME control sets the level at the 1/4-inch output jack. Overall: We were looking for a wireless mic, low cost, for our church to use primarily for prayer requests and announcements. We bought the AKG WMS40 and figured we might use the second mic once in awhile. This product does all we need and more! Highly recommend this and buying from zZounds received 2 days after I placed order! "Great mics for a price that can't be beat!" Overall: I purchased these mics after looking a lot of reviews. Was debating on whether to go with the Shure wireless or this one. I am so glad I opted for the AKG instead of spending twice the money on the Shure. These mics have plenty of range and sound great! I now have played several gigs using them and can't think of one complaint. Very happy!